the 2010 Winter Olympics in Canada are supposed to continue the trend towards more eco-friendly sports events, with the Olympic-related construction in Whistler and Vancouver aimed at fulfilling the goals of sustainable development. as part of this, the Olympic village in Vancouver is intended to be a model of sustainability, and has been touted as an example of what will eventually become mixed-use mixed-residence green urban living, accommodating businesses and residences spanning low-to-high-income populations. the project features the usual assortment of sustainable practices: use of solar energy, energy-efficient construction, catchment of rain water, recycling of human waste, etc. all of it takes advantage of Vancouver's natural environment. it's also serving to replace some of the more decayed parts of the city's waterfront with more attractive cityscape matching the existing urban environment. quite impressive, seeing how Vancouver is already--if you've ever been there, you'll know that it is one of the most beautiful urban areas of the world, with immaculate shorelines, well-laid street grids, abundance of green space, and all of it within minutes of some of the most beautiful sea and mountain terrain you will ever see (at least, it is during the summer...the winter is a bit of a different story). it's quite commendable. and something i'd like to see more sports venues, especially the mega-events, try to aim for. it doesn't reveal anything tawdry, like corruption or sleaze or anything of that sort. 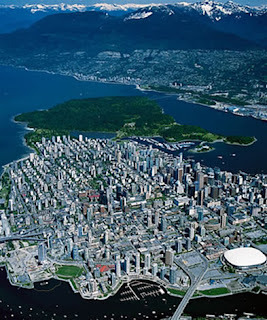 but it's interesting in that it shows that the Vancouver Winter Olympics are experiencing the same issues as all other Olympic construction: cost over-runs, decreasing profitability, over-optimistic plans, scale-backs in aspirations, etc. which essentially demonstrates that green, eco-friendly sports tied to sustainable development are not immune to the issues typical to other mega-sports events. in other words: it may be a good cause, but it still has the same problems. i wanted to make this point because a lot of the time we tend to associate good causes with ideal scenarios, with the assumption that because we aim for something noble (e.g., green Olympics) that we will be magically transported to a land where everything is easy. but life doesn't work that way. and it's dangerous to think so. because things invariably do run into challenges, and any assumptions of easy lead inevitably to disillusionment--and worse--cynicism. and that leads to the most tragic outcome of all: abandonment of a worthy cause. i think it's important to remember the lessons of our sport...or any sport. things aren't easy. especially if they're good. if anything, one of the reasons some aspirations are good is because they're hard. because this shows what a challenge they pose, and what achievements they are, and just what they can teach you in accomplishing them. good things are good because you have to be good to deserve them. you have to earn them. you have to change. you have to be better than what you are now.